Smith Memorial Hall, the principal music building during my days at University of Illinois. I spent thousands of hours in this building, taking lessons, classes, practicing, going to concerts, and meeting with friends. By the time I left University of Illinois, building work was already under way for the impressive Kraenert Center for the Performing Arts, which I have visited and attended concerts in, but was just a big hole in the ground when I left. Shortly after that, the new music school and library was put up across the street from Kraenert. It's now already considered an old building that needs replacing. However, its architecture is plain, like an office building, and without any of the character that Smith Hall has. Smith is still used for its recital hall and some music school classes. This is the main entrance, although ninety percent of the time I entered through the door to the right in this picture, sometimes through the one to the right, or the ones at either side of the back of the building, and least often through these doors. 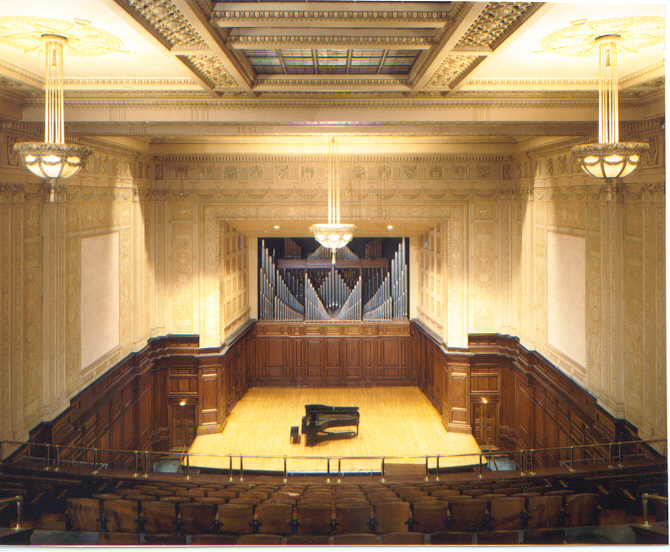 The recital hall in Smith Memorial Hall, as seen looking down on the stage from the balcony. I still dream about this place at night. Several of my student compositions were premiered here, and I performed on it many times. As reported in the story, I counted up to 35 concerts a semester I attended in my early years of counting them. Almost all were here.